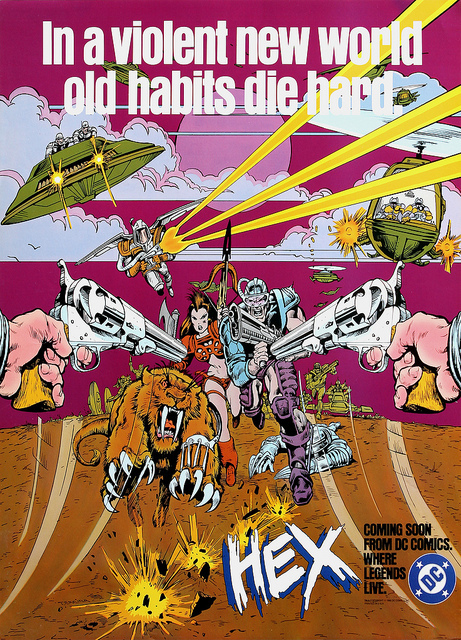 When Jonah Hex #1 (March/April 1977) debuted, there were only a handful of Western comics still being printed, many of which either featured more than one character or were padded out with reprints. 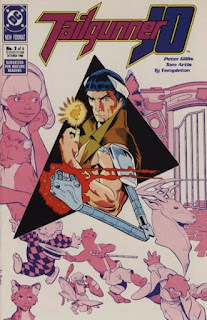 Starting up a brand-new Western comic based around one solitary character with a new story each and every issue may have been seen by some in the industry as a huge mistake, but both Fleisher and Hex were more than up to the task. The story perfectly illustrates some key facets of Jonah's personality: his black sense of humor, his unspoken need to protect the weak (especially children), and his determination to see that criminals get the punishment they deserve no matter what. 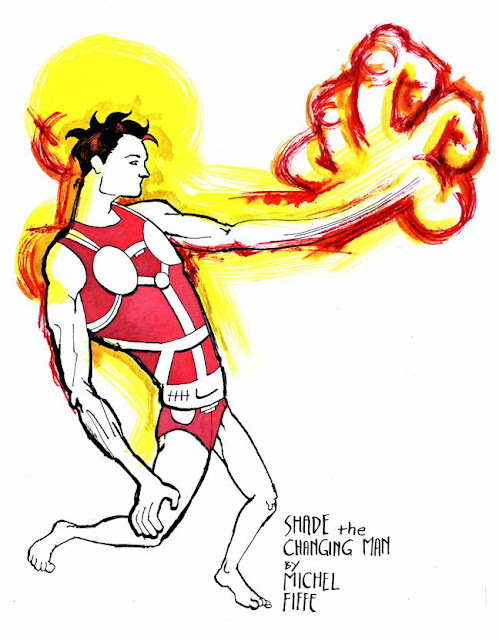 It was a good way to introduce the character to potential new readers, especially since Jonah was about to embark on his longest storyline to date. Jonah Hex #2 begins with Jonah accepting a job from a man claiming to be with the U.S. Secret Service, but in truth, he works for Quentin Turnbull, a Southern plantation owner who wrongly blames Jonah for the death of his son during the Civil War. 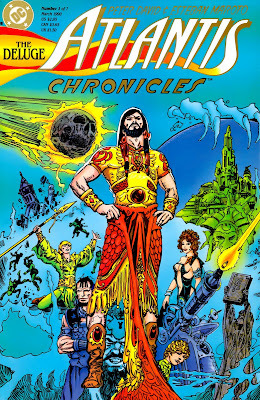 Turnbull was last seen back in Weird Western Tales #29-30  -- where we learned of the Fort Charlotte Massacre -- and though he appeared to have died at the end of that story, Fleisher brought him back to menace Jonah once more. Turnbull arranges this phony job wherein Jonah is supposed to win the confidence of a Mexican bandito known as El Papagayo, then spy on the man for the U.S. government. Unfortunately, the guns Jonah gave El Papagayo as a show of good faith turn out to be useless, and Jonah barely escapes the furious banditos by the skin of his teeth. Hex and Joanna escape the blazing cabin, and though she says that she genuinely loves him, the man ain't buyin' it, giving her a good slap in the kisser before riding off. Moments later, we find that Jonah's been cleared of the stagecoach-robbing charge: an artist on the stage did a sketch of the robber, and while the Chameleon made himself up to look like Hex, he put the scar on the wrong side of his face, therefore confirming that he was an imposter. 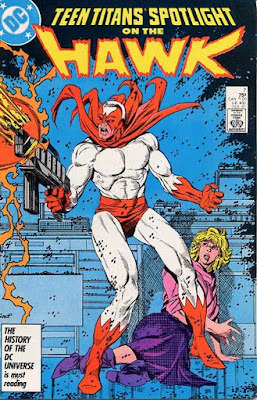 Hex is still wanted for murder, though, and worst of all, the Chameleon survives the fire, horribly burned and swearing vengeance upon Hex! 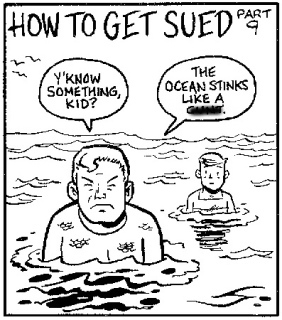 After this issue, the crazy Turnbull-backed shenanigans suddenly drop off, though Jonah’s “fugitive on the run” status still gets worked into each story. 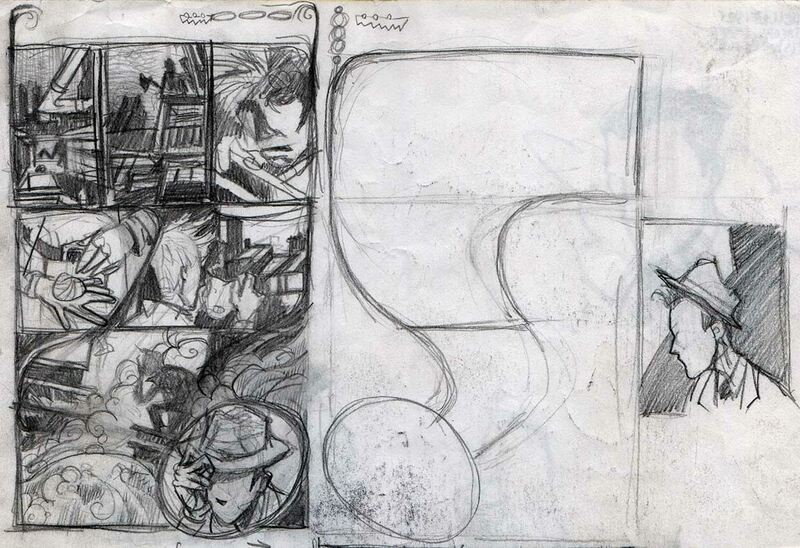 To that end, Jonah Hex #5 (a reprint of All-Star Western v2 #10 ) gets a new framing sequence by Garcia-Lopez. The opener shows a posse in pursuit of Hex crossing paths with a woman on a buckboard. 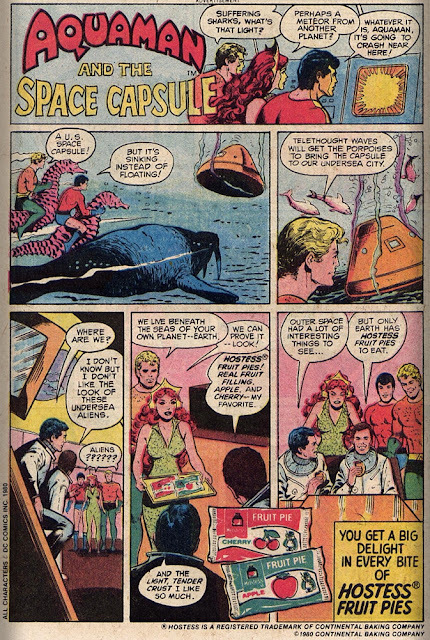 Turns out this is the same lady Jonah helped in his very first appearance, and when they ask if she’s seen him, she replies, “Ah ain’t laid eyes on thet man in more’n five years, sheriff!” The comic then rolls into “Welcome to Paradise” proper, and with the exception of some coloring changes, it's exactly as it was the first time around (complete with credits for Albano & DeZuniga). When the tale is through, we get a final page with the sheriff saying that Hex is now a wanted killer, and he tells the woman, “You see any sign of him, you let out a loud holler, hear?” before riding off. Cut to Jonah poking his head out from beneath the tarp covering the buckboard -- he’d been hiding there the whole time -- and thanking the woman for the assist. She in turn thanks him for what he did all those years ago: saving her life and paying off the farm. After the anger she’d shown him when they parted ways originally, this scene is rather touching, especially in light of the mess his life had become. It’s a reminder for both us and himself that he is a good man, he just has very rotten luck. So now you know: Jonah’s scar is the result of a red-hot tomahawk to the face. As with the Fort Charlotte Massacre and the "fugitive" storyline this tale is embedded in, it all boils down to yet another false accusation, as well as rejection by a father figure (in this case, his actual father is part of the equation), and in the long run, events like this have to color how Jonah thinks of himself. 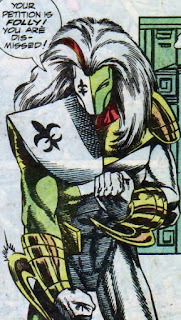 Michael Fleisher once commented that someone like Hex must have a certain amount of self-hatred to do what he does because, as a bounty hunter, he’s putting his life on the line constantly. To be sure, coming from an abusive household isn’t the best start for a boy, and suffering through the indignity of slavery would just lower his opinion of himself even further. But Jonah did manage take away one very important lesson from all this: he learned how to endure. Between what the Apache did to him and the torture his father already put him through, there’s little the world can throw at Jonah that he hasn’t already experienced. And there’s the more practical lessons in the form of hunting, tracking, and fighting skills that he picked up during his years with the Apache. 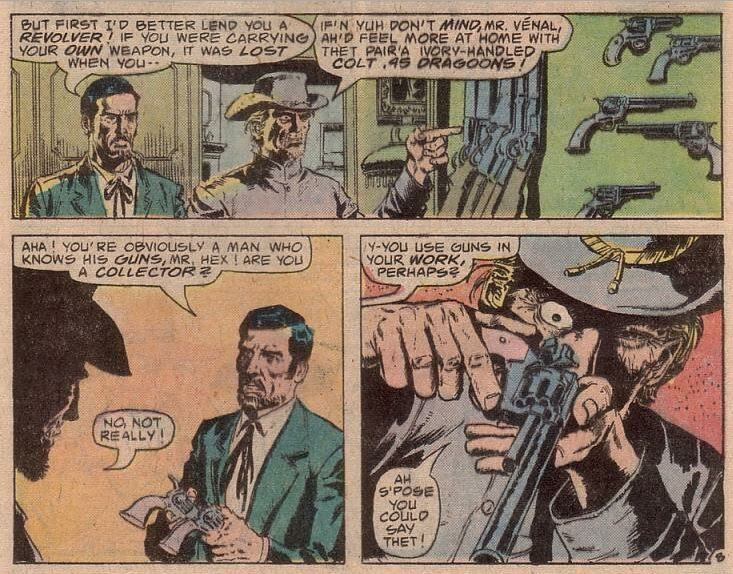 So much of what makes Jonah Hex the man he is can be traced back to his Pa trading him away for a stack of pelts. Without that event, he’s nothing. El Papagayo returns to get revenge on Hex in Jonah Hex #9-10, and in Jonah Hex #11, Jonah runs into Joanna Mosby again (sadly, she dies trying to protect him from some fellas that busted him up pretty bad earlier in the story, and Jonah shows that he indeed had feelings for Joanna by giving her one last kiss before she passes away). 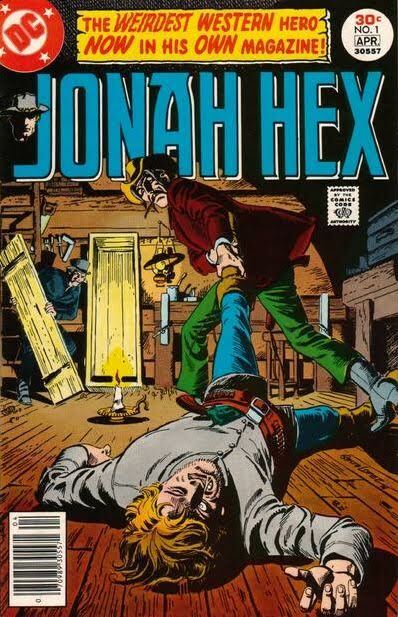 While all three issues reference the "fugitive" storyline in one way or another, there’s not even a brief mention of Jonah’s troubles in Jonah Hex #12, which focuses instead on Hex looking for a friend lost in the Louisiana bayou. 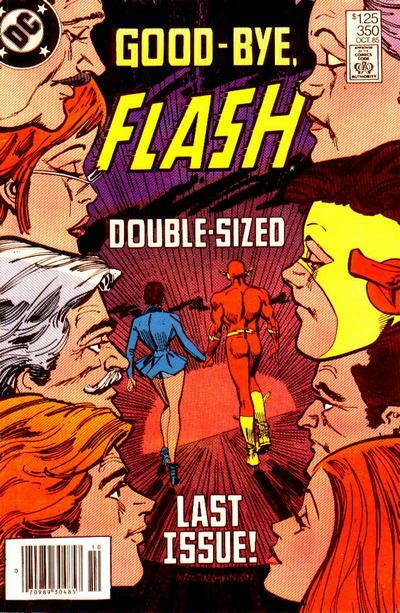 It’s possible this tale may have been written before the current storyline was cooked up and held in reserve in case Fleisher fell behind, a theory lent credence by the fact that Jonah Hex #13-15 were written by David Michelinie, who Fleisher had brought to DC after coming across his writing samples in editor Joe Orlando’s slush pile. 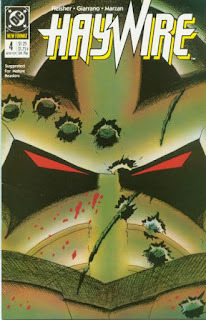 With the exception of the John Albano-penned reprint pages in Jonah Hex #5, those issues were the only ones not written by Michael Fleisher during the title's entire run. And that's it. After fifteen issues of non-stop action, Jonah’s troubles are all resolved rather succinctly in one page. 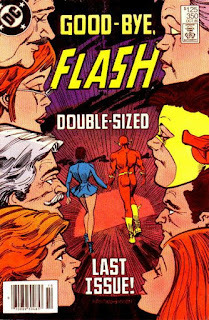 Overall, the "fugitive" storyline is burdened somewhat by too much padding -- about half of the issues in this arc could be removed without affecting the plot -- but on the other hand, we did get Jonah’s "origin story" in the midst of all this craziness, along with a new bad guy in El Papagayo, who will turn up to menace Hex for years to come. 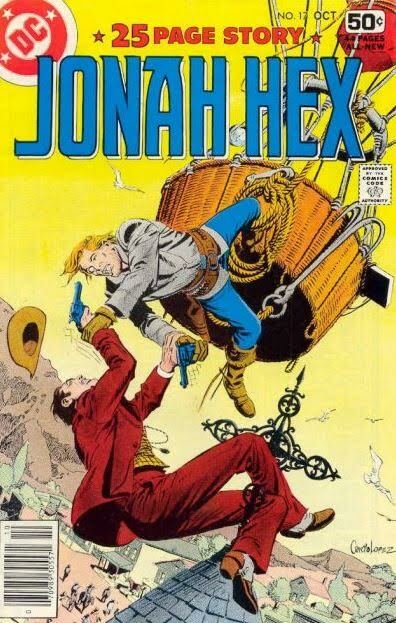 With its opening scene of Jonah getting trapped in a hot-air balloon and floating out to sea, readers of Jonah Hex #17 back in the day might've thought Fleisher was setting up another long-term storyline, but in truth, it was just a brief side-trip. The bounty hunter eventually ends up off the coast of Brazil, where we runs afoul of both illegal slavers and cannibals (he manages to survive both). By Jonah Hex #18, he's found a small patch of civilization in the form of a rubber plantation, and it's there that Jonah acquires something that would later be considered part of the "classic" Jonah Hex look: a matched pair of ivory-handled Dragoons. 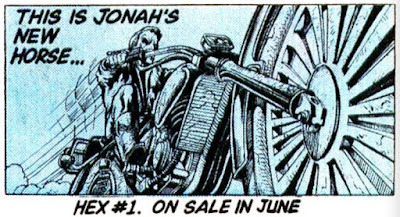 Though there are errors in both the text and the art this first time out, it’s specified in the letter column of Jonah Hex #31 that these guns are meant to be Whitneyville-Hartford .44-caliber Dragoon pistols, manufactured by Colt Firearms back in 1848, with a limited run of only 240 (only a few dozen still exist). It’s not only a rare handgun, but deadly as well, with a firing power that wasn’t surpassed until the invention of the .357 Magnum in the 1930s, so you know Jonah didn’t just pluck those things off the wall at random. 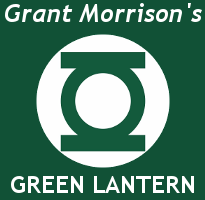 He uses the Dragoons to great effect later on in the story, and would continue to do so long after he left Brazil. 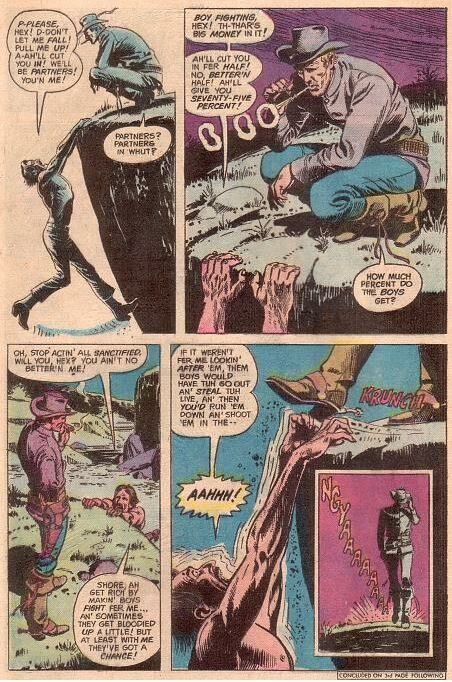 How exactly he got back Stateside is unknown, as Jonah Hex #19 (December 1978) makes no mention of it. 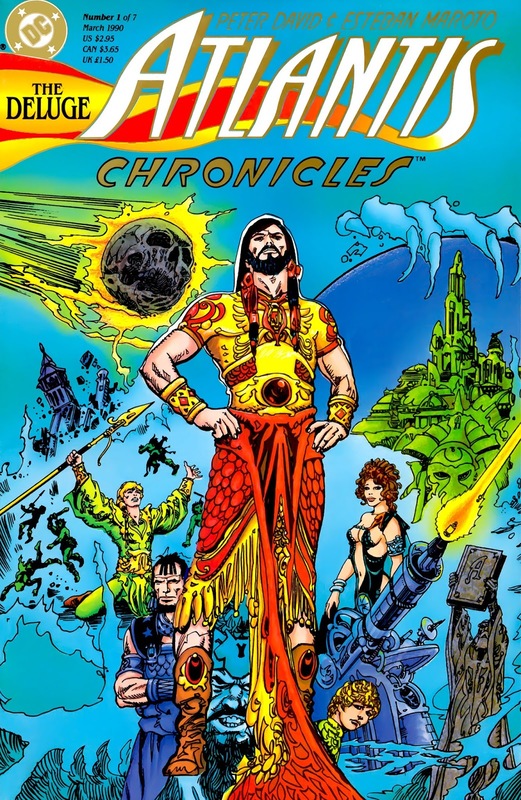 In our next installment, we'll take a look at another comic that hit the stands around the same time Jonah was having his South American adventures. It presented a wholly different view of the bounty hunter, and would have an impact on Hex history for decades to come. Jonah's been getting a lot of attention recently - no doubt due to the recent announcement that actor Johnathon Schaech will be portraying Jonah in CWTV's Legends of Tomorrow TV series - and we thought "what better time than now to reacquaint DC fans with Jonah Hex's rich history?" 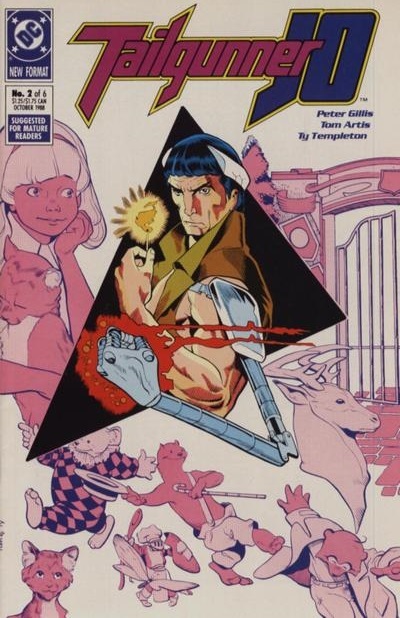 Jonah Hex was published by DC comics predominantly throughout the 80s (about 30+ years after the western-genre comic book was at it's all-time high), so this really falls into DC in the 80s territory. This may sound clichéd, but Jonah Hex is one of my favorite DC characters. 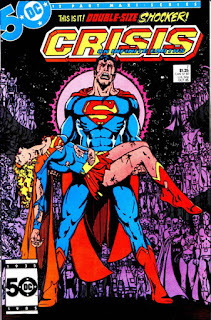 He wasn't always my favorite - I used to dread his comics as a kid (I was more interested in DC 'super hero' titles at the time) so I'd say that Jonah became an 'acquired taste' once I had gotten older and needed a reprieve from the 'super hero' genre. I really wanted to run something detailing how great Jonah was. 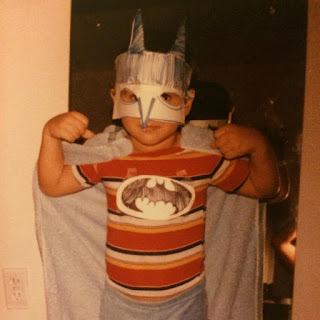 Admittedly, we kind of lucked out when esteemed blogger and fan-fiction writer, Susan Hillwig, offered to submit an article series detailing the evolution of the character. Susan is quite possibly one of the biggest Jonah Hex fans I know, being a major contributor to The Jonah Hex Corral and the Jonah Hex, Via Pony Express FB page. 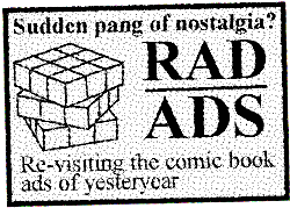 Susan also wanted me to mention the Jonah Hex-themed Matching Dragoons website for your reading pleasure. Seeing as how the first issue of Jonah Hex was published in 1977, Susan will start from there and lead us all the way to 1987. Hence, a decade in the life of Jonah. ANOTHER contest submission that didn't qualify due to geographical reasons, Juan Havarti is a "fan artist with big dreams" with his own deviantart gallery. 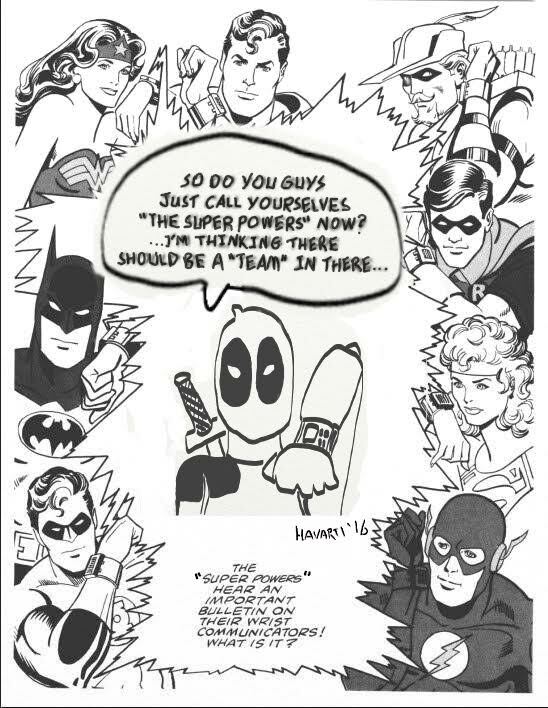 Love the reference to Batman's awkward arm placement, Juan. Wanna enter the contest? it's not too late: check details here. 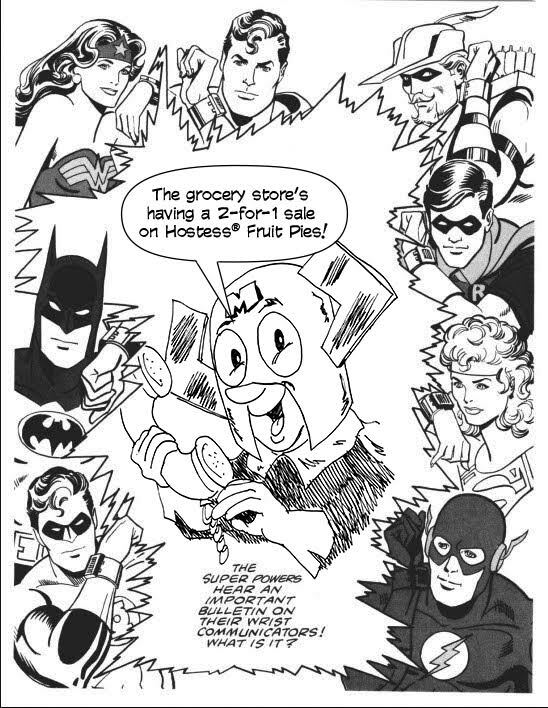 ...a hyper-muscular Captain Carrot, apparently. 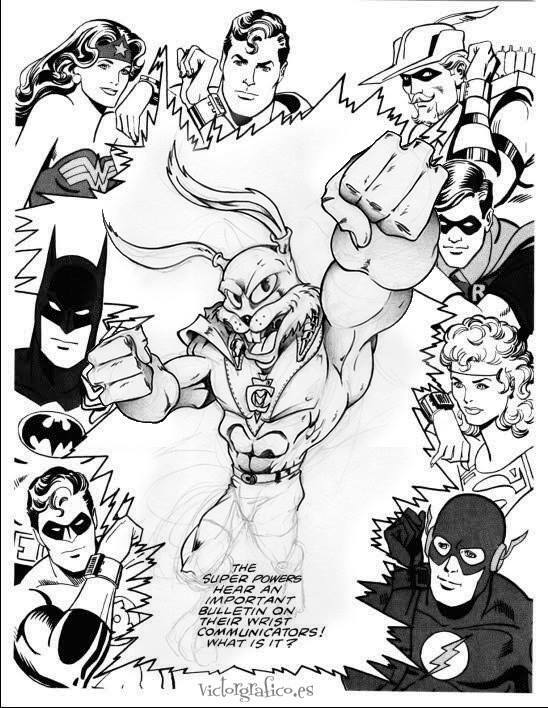 To be fair, if a jacked-up super-rabbit was tunneling through my garden, I'd be contacting the Super Friends too. 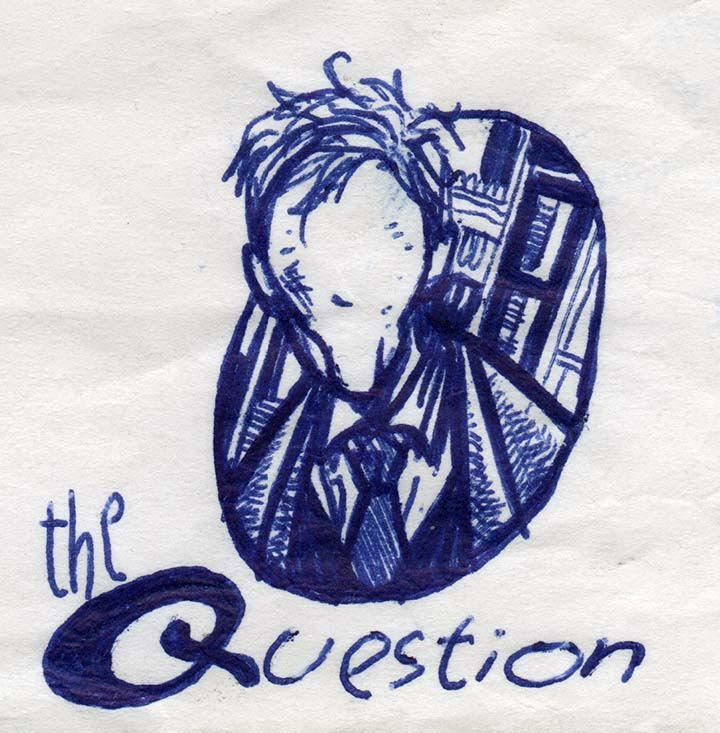 Our first submission comes all the way from Spain, courtesy of Victor Grafico. Since he's doesn't have a North American mailing address, he doesn't qualify. 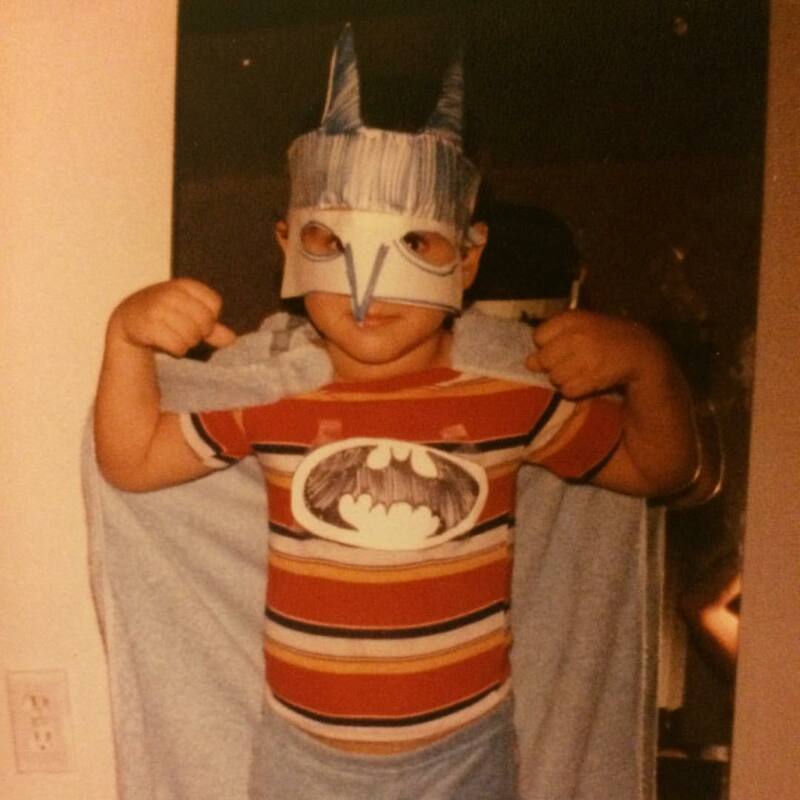 BUT he gave us permission to post his submission - so here we are. 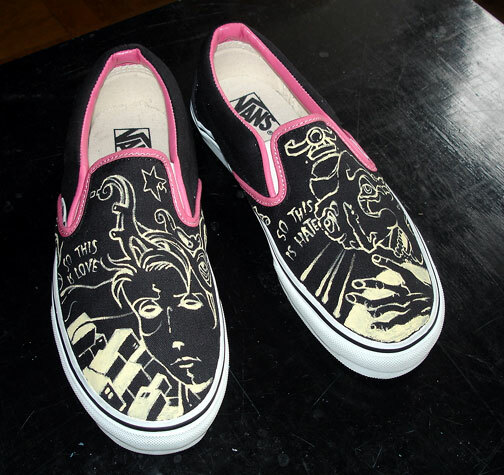 Victor is a graphic designer and draws on the side. 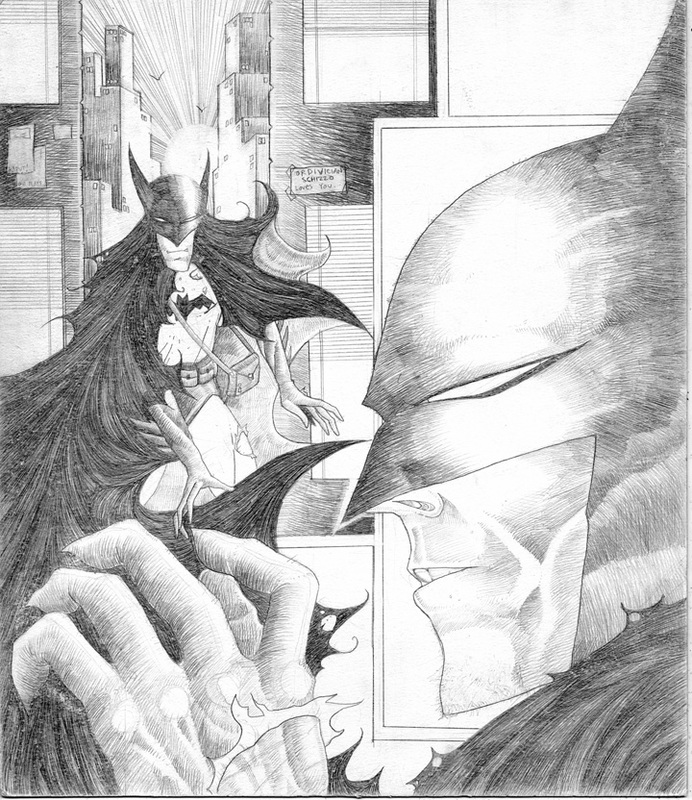 Check out his online gallery at http://victorgrafico.es/. Jonah Hex was on it’s last legs when DC comics decided to to take a chance on this new series. 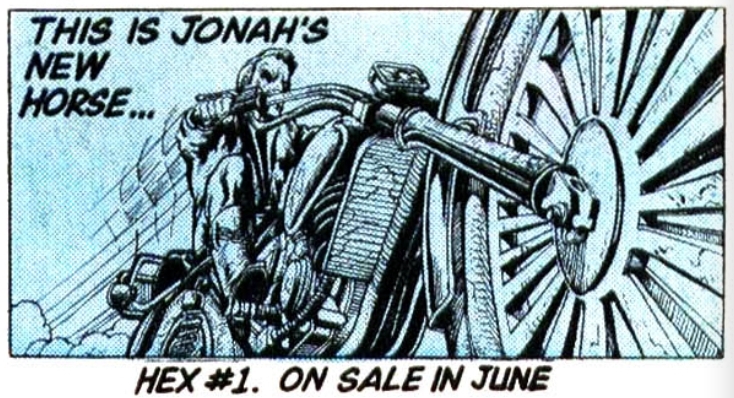 By 1985, Jonah Hex had been in publication for 9 years and had narrowly escaped three near-cancellations making it the longest-running (and only) Bronze Age Western comic book at the time. 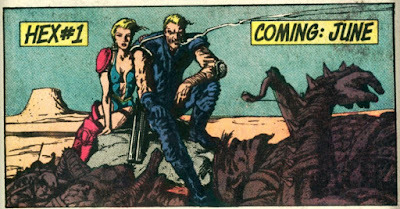 Things were looking pretty grim for Jonah Hex come 1983: super-hero titles were the popular genre at the time, the title had recently been passed up for the ‘Baxter’ treatment (higher cover price and better quality paper) because it wasn’t considered by DC to be a 'fan favorite’, and - the final nail in the coffin - Jonah Hex became a bi-monthly series after #85 (1984). 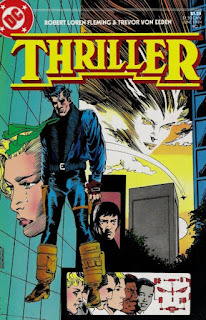 Writer Michael Fleisher explained that the book wasn’t doing so well in the Direct Market (apparently Jonah Hex always did better on the newsstand) and it was probably due to all of the super-hero titles it had to compete with at comic book shops. 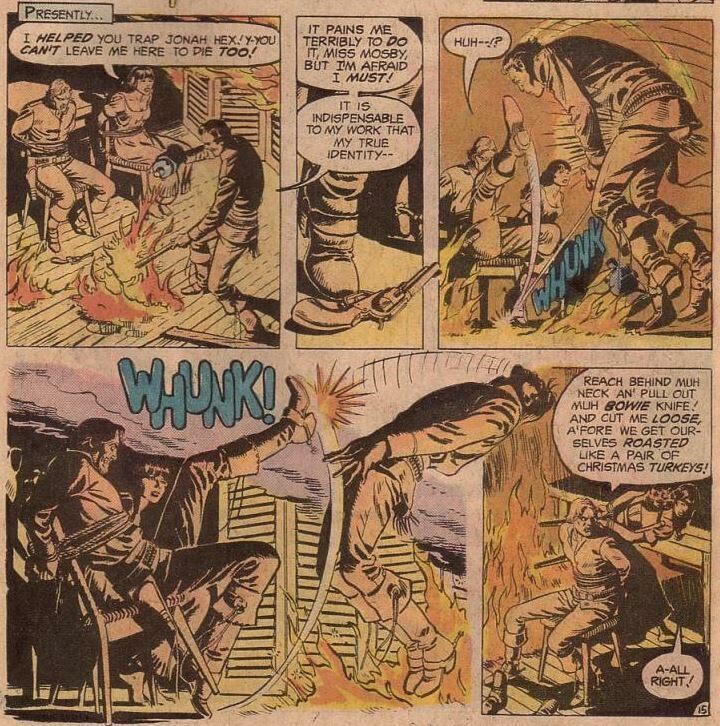 What distinguished Jonah Hex from just about everything else on the market was the fact that it was a "typical Western" - it was set in the post-Civil War American West (circa 1850 - 1900), stayed within it’s own universe, the anti-hero protagonist was a flesh-and-blood 'everyman’, and the storylines were true-to-life with no super-villains, aliens or any other fantastic elements. Michael Fleisher had written Jonah Hex stories since Weird Western Tales #22 (1974) and Jonah Hex had pretty much become his character by this point, so when DC decided to shake things up with the new Hex series it was a little surprising that it was revealed as Fleisher’s idea. Well, actually that’s not the whole truth - Fleisher credits the idea of Hex to Ed Hannigan who, about a year prior to the publication of Hex, showed up in Fleisher’s office with a new electric pink 'Hex’ logo he’d designed for no reason whatsoever. 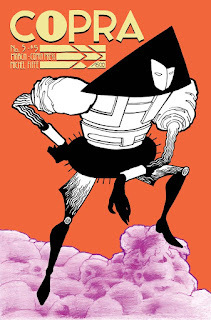 This got Fleisher thinking about what kind of book would suit that title and a title about Jonah Hex trapped in a post-apocalyptic future was proposed to the DC editorial board. But I kind of suspect that story to be bogus, too. 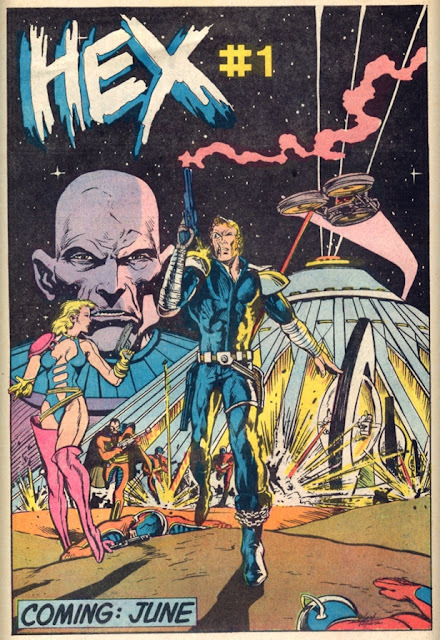 The first person (that I know of) to suggest pulling Jonah Hex out of his environment and placing him in a new locale to fight aliens and super-villains was a fan named Doug Taylor who wrote in to Jonah Hex v1 #76 (1983). Taylor argued that the series had gotten formulaic and that Jonah could be placed in any situation and still be interesting - he wasn’t criticizing, he was only offering suggestions on how to revitalize the series and it’s dwindling sales. The letter column writers dismissed the idea and Jonah Hex fans flamed poor Taylor’s suggestions in the letter pages of Jonah Hex for many issues to come. There are some pretty obvious parallels between Hex and 1980s films like Escape From New York (1981) and the Mad Max trilogy (1979 - 1985) if for no other reason than they are set in a post-apocalyptic future and the anti-hero protagonist rides a motorcycle and is good with a gun. All of those films had a nice North American reception at the box office and earned a cult-favorite following - so that could’ve been another source of inspiration. No matter what the true source of inspiration may have been, DC decided that Crisis on Infinite Earths was the best time to take Jonah Hex in a completely new direction and send him to 2050 AD. Harbinger (in the Crisis on Infinite Earths maxi-series) makes a very candid comment about Jonah Hex being plucked out of the past and being sent to the far future - so that pretty much wraps up everything, right? Wrong. 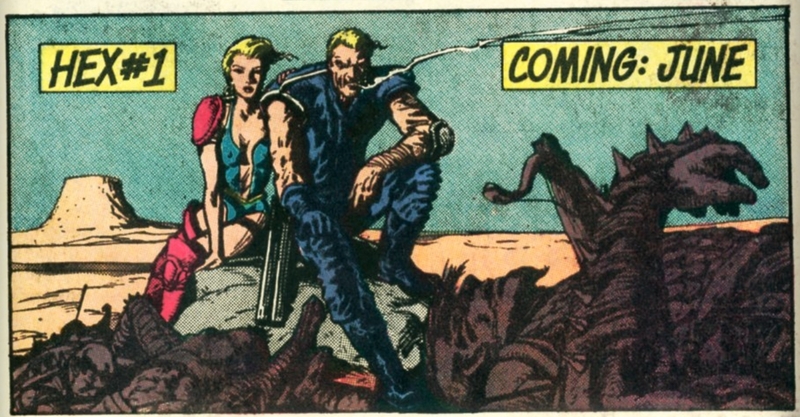 Hex created two major continuity problems:Jonah Hex gets sent to a post-apocalyptic future that had somehow endured some massive nuclear war in 2045 AD that left North America as a (mostly) dystopian wasteland. 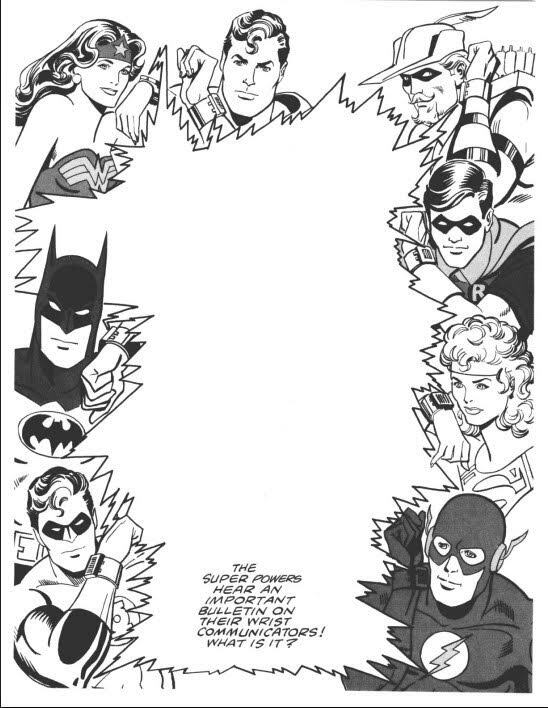 This was in direct conflict with the Legion of Super-Heroes’ future timeline (then written by Paul Levitz). 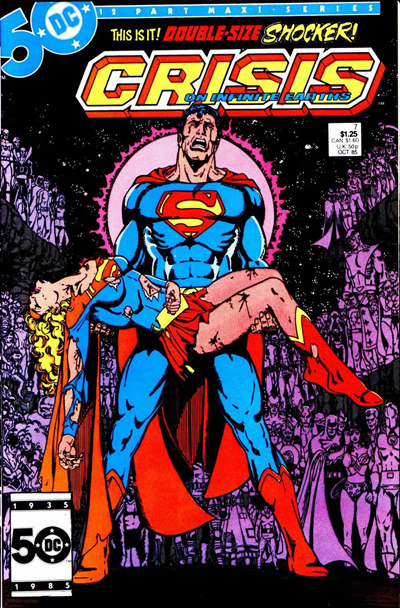 After the Crisis on Infinite Earths it was decided that the DC universe would be part of one consistent universe and only have one possible future, so now Levitz had to try to incorporate the new nuclear-ravaged North America into Legion of Super-Hero’s past continuity. In Jonah Hex Spectacular (1978), Fleisher wrote “The Last Bounty Hunter” - a story which details the death of Jonah Hex in 1904. This creates the big continuity paradox of 'how was Jonah supposed to be killed in 1904 if he was stuck in the year 2050’? 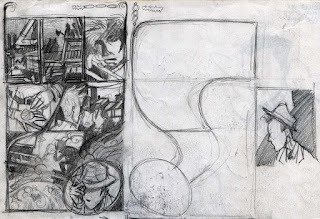 Fleisher never resolved this, but the ending of Hex indicates that Jonah does somehow make it back to his own time - the reader just never knows how. 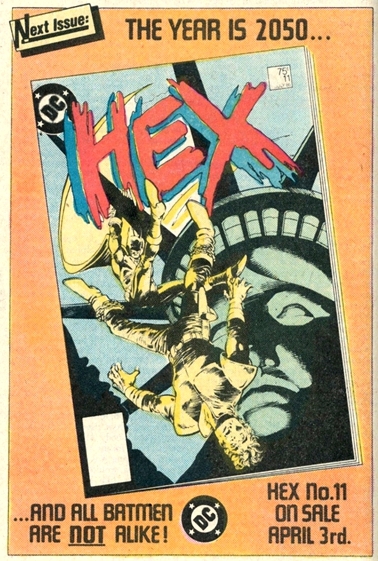 Hex lasted 18 issues from 1985 to 1987 and was cancelled because sales were too low. I think the main problem with the series was that it outraged a lot of the die-hard Jonah Hex fans who felt that moving him out of the old West and into the far future was basically sacrilege. I suspect Jonah being sent to 2050 AD was a last ditch attempt by Fleisher to keep the book alive - Jonah Hex v1 #92 ended hastily with a lot of dangling plot lines left unresolved (the new Hex series was previewed in Jonah Hex #89). 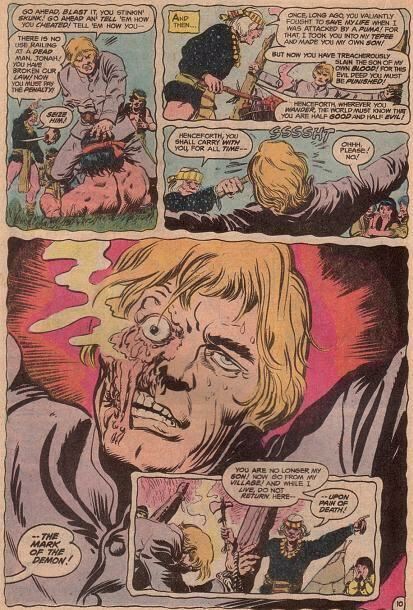 Hex was still a good series, but I’m sensing a lot of it’s regular readers were new fans since many letters in the letter column inquired as to the origins of Jonah’s disfigured face. 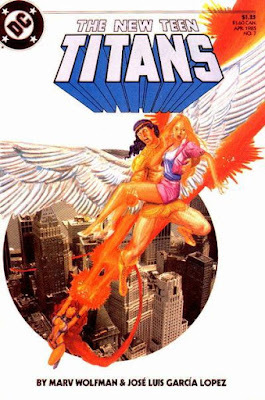 The series did not have the Comics Code Authority seal on it’s cover, but wasn’t overly violent and the language wasn’t profane (and I don’t remember of any implied sexual situations). Still written by Fleisher, the series was fast-paced and had plenty of action. 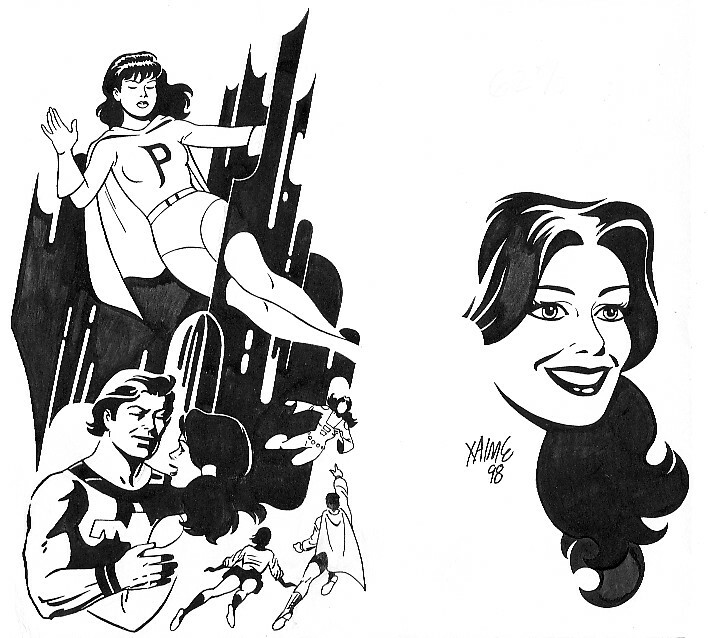 The Legion of Super-Heroes made an extremely brief appearance (Hex #10; ties in with Legion of Super-Heroes v3 #23) and a future version of Batman even guest-starred (Hex #11 - 12). 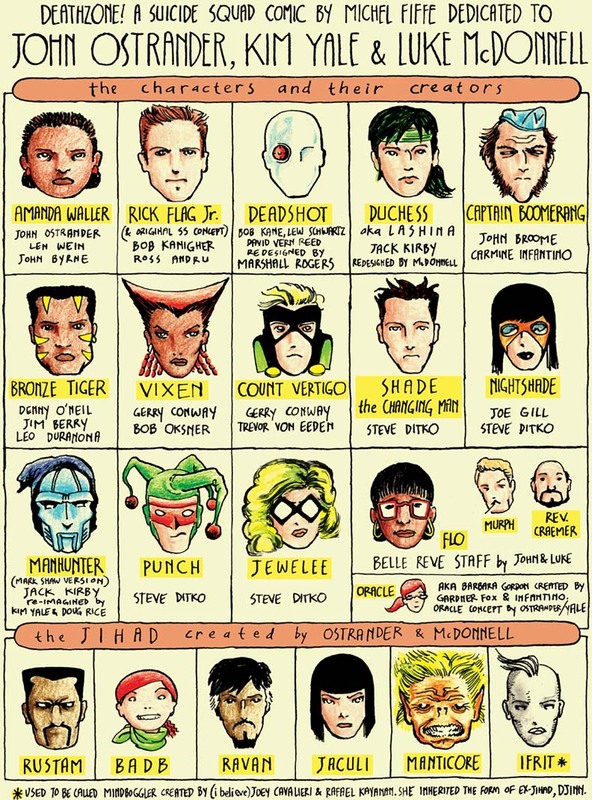 I’m going to assume that the Batman appearance was just a marketing gimmick as Fleisher stated that Hex #11 received some of the highest sales of the series. 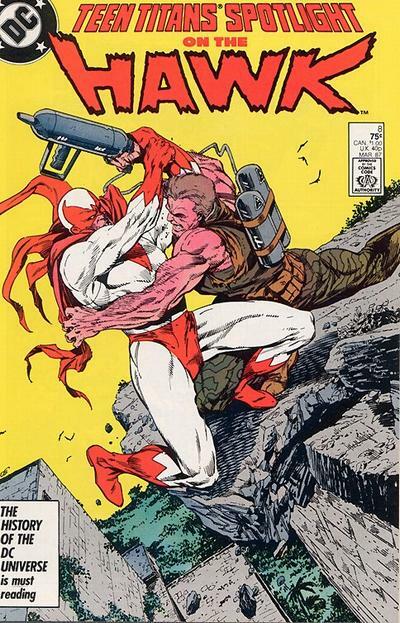 Mark Texeira illustrated the majority of the first fourteen issues of Hex, and Keith Giffen pencilled issues #15 - 18. While Texeira was a great choice and natural fit for the Hex series, Giffen was not. 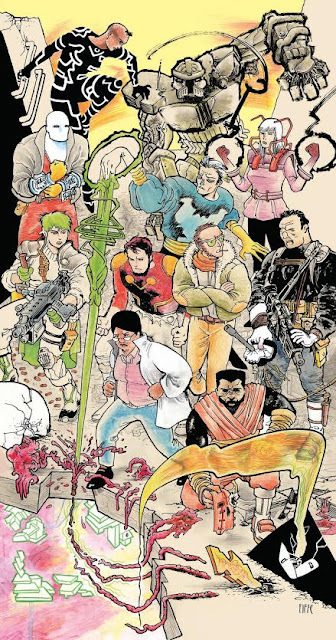 Many fans wrote in to complain that Giffen’s art was too confusing and chaotic, and threatened to drop the book if Giffen wasn’t dropped as an artist. I’m inclined to agree with the die-hard fans that Jonah Hex works best as a Western character in a Western environment (as nine years of continuous publication have demonstrated). 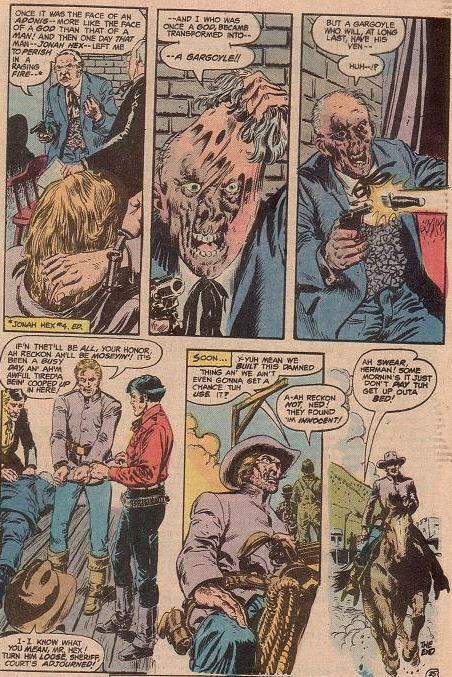 Thankfully, Jonah Hex went back to his Western roots in DC’s Vertigo imprint during the early 1990s. Chris Sheehan gives a really descriptive review of Hex v1 #18 (1987). Susan Hillwig's in-depth review of the entire future Hex run. 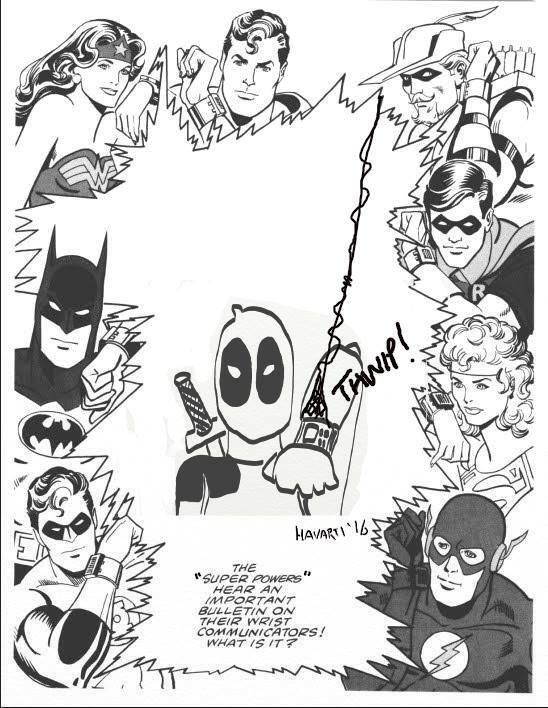 This article first posted December 2013 on the DC in the 80s tumblr.